Wildlife-film.com Feature Page - The BBC Life Story story - Filming Techniques! The BBC Life Story story - Filming Techniques! 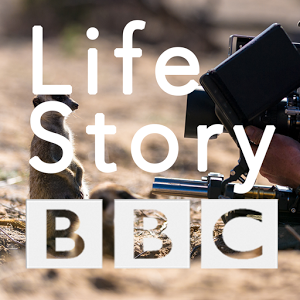 BBC Life Story is a landmark 6-part TV series, currently available on the BBC iPlayer. Presented by David Attenborough, it tells the remarkable and often perilous story of the journey through life. 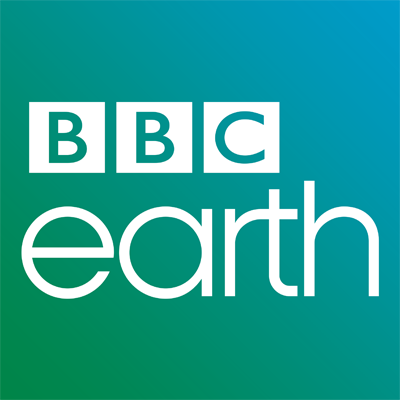 This is the first series that the BBC Natural History Unit has shot in Ultra High Definition (4k). The quality of the images is much higher with 4k because it captures four times as much information and detail. This has the effect of bringing the viewer closer to, and more in to, the animal’s world. The detail is not just for fun - it actually brings you closer to, and more in to, the animal’s world, because a lot of this is about seeing the lives of these animals on their faces and in their eyes. The Life Story team spent 1900 days filming the series, in 29 countries across six continents. They travelled a total of 1,850,798 miles – the equivalent of circling the globe 78 times. They recorded a total of 1800 hours of footage – that’s 300 terabytes of data, or the equivalent of 64,000 DVD’s. New filming techniques with the steadicam reveal to viewers the animal’s view of what is happening for the first time. In this instance, the steadicam was used to film a meerkat's view of an encounter with a cobra. When meerkats find a cobra in their territory they don’t try to attack it. Instead they mob it, leaving it in no doubt that it has been seen. The snake may strike to push the meerkats back, but they are too fast to be in danger. The situation quickly turns into an outdoor lesson for the youngsters in how to see-off a snake. This fascinating behavior is only understood because of the work of Cambridge University scientists, who have undertaken long-term studies on wild meerkat populations in South Africa. In filming Life Story we have tried to take the camera into the animals’ world, wherever possible, in order to offer the viewer a sense of what it is like to be an animal as they face the great challenges of their lives. So we asked the scientists if they thought it was possible to film this interaction with a camera in the meerkat mob. The scientist’s method for studying this behaviour is to bring a snake into a wild meerkat territory, well away from the burrow system, and wait to see if a meerkat finds it. If it does then the natural behaviour unfolds. They have recreated this for film crews in the past and agreed to do so for us, with one of their experts overseeing the process to ensure there was no risk of harm coming to any animal. 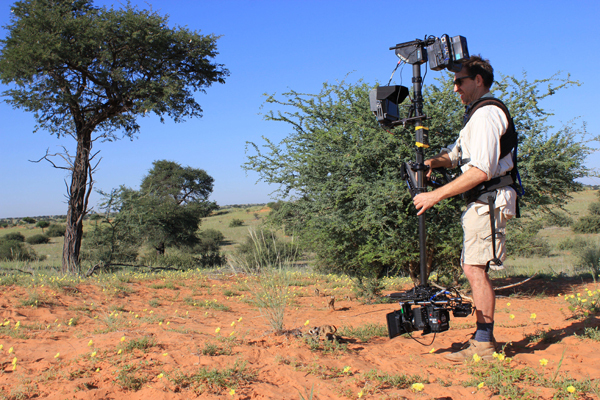 This allowed our crew to test a technology new to wildlife filming – the steadicam. It’s a heavy, counter-balanced system used in filming dramas, that makes the camera effectively weightless so the operator can move it smoothly around a scene. It was first used in the movie Rocky, to film the famous scene of Sylvester Stallone running up the steps of the Philadelphia Art Museum. By adapting and miniaturizing this system and hanging the camera beneath it, almost at ground level, cameraman Toby Strong was able to film a unique point-of-view perspective of one of the most vital learning experiences in the lives of young meerkats. This technique was so successful that our crews were later able to use steadicam to film more meerkats as well as taking the viewer into the worlds of seals, turtles and kangaroos. It’s a wild bare-knuckle brawl for these grey kangaroos – their tactics include eye gouging, scratching, wrestling and kicking below the belt. Male kangaroos are in training to become outback street-fighters as soon as they emerge from their mother’s pouch. The training starts with mum, but soon progresses to other young roos. But unlike most humans, the fighting doesn’t stop when they reach adulthood, it gets even more intense and when a big fight kicks off, the whole meadow stops to watch. These shots were captured in the middle of a 100-strong mob of kangaroos by filmmakers using a hand-held stabilised camera mount called a MoVi. This helps bring movement, boldness, detail and agility into the film sequence. 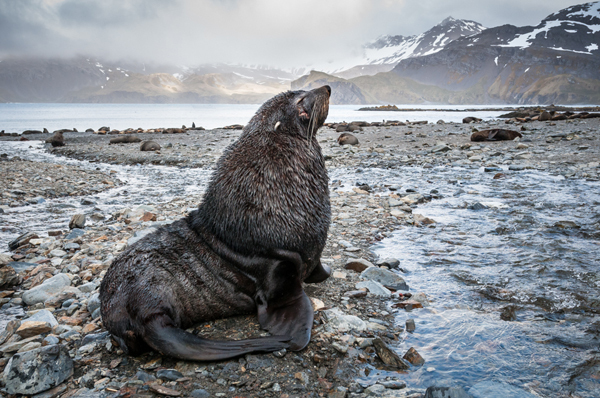 To film fighting fur seals, the team also used a steadicam to get in close to the action. Aerial filming: Helicopter filming reveals a wild dog hunt from start to end for the first time. One of the animals we most wanted to film for Life Story was the African Hunting Dog. Normally these animals live among dense scrub and as a result are renowned for being extremely difficult to see, let alone film. However after a year of research, the Life Story team discovered a location in Zambia where a large pack of Hunting Dogs had successfully bred, and were occupying an open, grassland territory. This was a rare opportunity to film one of Africa’s most rapidly declining mammals. The team filmed from a 4 x 4, but the dogs were so fast during a hunt that it was very difficult to keep up with them to film a complete hunt. In order to capture a full picture of how they work together to hunt wildebeest the team needed to film from the air. There were no suitable helicopters in Zambia so the team had to call one in from South Africa. But at the last minute, a sudden change in government policy rendered the flying permits null and void. After much time, effort and form-filling, during which the original, 10-day aerial-filming window was rapidly closing, the team got the necessary permits. They were left with just 2 days to attempt to film something that had never been achieved before – an aerial view of a complete hunt, from start to finish. However things went well and cameraman Jamie McPherson, using an aerial-filming rig that allowed him to film from a kilometre away, was able to film an entire hunt and record the dogs strategy and team-work. The Life Story team heard about a unique situation with cheetahs in Zimbabwe involving experienced naturalist Kim Wolhuter. Over a period of 18 months, and with the permission of the authorities at the Malilangwe Reserve, Kim followed, first in a vehicle and then on foot, a wild female cheetah with her cubs. One of the cubs was fitted with a radio collar to allow Kim to locate the family each morning. They came to totally accept him as an unthreatening part of their environment. This unique relationship allowed Kim to observe their family life in intimate detail. But this relationship was exclusive to Kim - the cheetahs displayed their natural caution to every other human. Camerawoman Sophie Darlington filmed from a distance, on a long lens. But Kim, who is also a film-maker, was able to use a camera fitted with gyro-stabilisers to smooth out movement, and film the event from remarkably close quarters. The result is a uniquely intimate portrait of the most critical hunt in these young cheetahs’ lives.